This recipe is 4 SmartPoints per serving. If you add spaghetti, it will be 10 SmartPoints per serving. 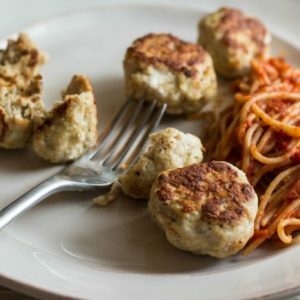 1 serving is 3/4 cup spaghetti and 2 meatballs. In a large bowl, combine all ingredients except the spaghetti noodles (if using) and mix together. On a sprayed cookie sheet, divide out the meat mixture and make into small balls. Bake for about 15-18 minutes, until cooked through. Serve immediately with spaghetti, if using.